A design for an online food ordering website can cost several thousand Dollars. Development can take several weeks or even months. During that period, you won’t make any money selling food online. 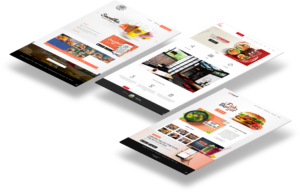 However, a simple restaurant website builder will help you launch an online food delivery website quickly. How does the UpMenu restaurant website builder work? 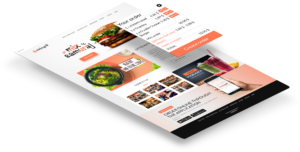 Using the UpMenu restaurant website builder, you can easily build online food ordering websites by yourself, without the help of IT specialists or the need for complicated technical skills. All you need to do is choose the template, match it to your restaurant’s image, and add the key information. This way, you save time and money, while online sales can be launched significantly quicker. Thanks to this, you will start making money faster. 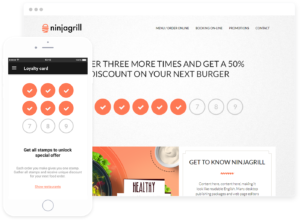 At the same time, your restaurant website will be automatically adjusted to mobile devices. 69% of customers order food only through their mobile devices. (source) This is why it is very important for your mobile website to look good when displayed on these devices. Thanks to the UpMenu restaurant website builder you can save even more. Within the scope of the cooperation, you will receive free hosting and an SSL certificate from us. Read more about this in our article entitled: Professional restaurant website for your business. 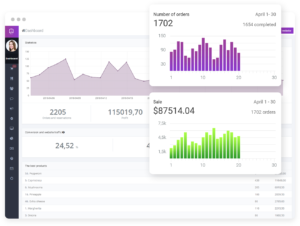 The money you save this way can be spent on new marketing activities, which will help you increase the number of orders, and hence your profit. 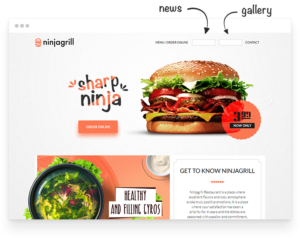 Choose from a variety of templates for online food ordering websites. You will easily find one to match your restaurant’s atmosphere best. This way, you will start building your brand online and gaining new customers. 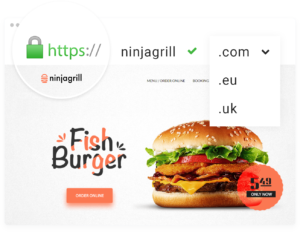 Each of the online food delivery website templates can be adjusted in any way to the appearance of your restaurant’s logo, for instance, by changing colours, fonts, and adding photos. All these changes can be introduced in a simple way, while allowing you to save money that you would normally spend on IT services. You can build a one page restaurant website with only the key information or add more sections. Publish a photo gallery, information about your team, and job offers. The choice is up to you – using the restaurant website builder, you can decide how your restaurant website will look. 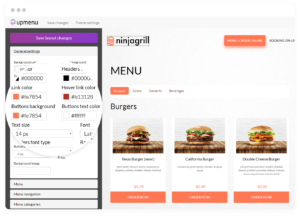 The UpMenu restaurant website builder will make it possible to launch the online food ordering system in a simple way, thanks to easy integration. This way, you save time and money – everything you need to make a profile for selling food online can be found in one place. By using the UpMenu restaurant website builder for building an online food ordering website, you can make any changes when you need to. They will be immediately visible on your restaurant website. You don’t have to pay for IT services and wait for the changes to be introduced. Due to the above, you can quickly notify customers, for example, about changes in the restaurant’s operating hours. All changes will be immediately visible for your customers. When you build online food delivery websites with UpMenu, you will gain access to completely new marketing tools that will help you generate more online orders. This will enable you to earn more and save time as all key marketing tools will be available in one place. The UpMenu restaurant website builder will provide access to detailed reports that are generated automatically. Based on these reports, you can make more effective business decisions. This way, you will increase the number of customers and your profits without dedicating additional time. All required information can be found in the UpMenu system. If you need online food delivery websites and are looking for a restaurant website builder, try out the UpMenu system. 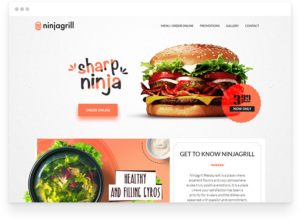 You will be able to easily create a really good restaurant website that will be self-sustaining, in a simple, intuitive way. Just choose the template you like and adjust it to your restaurant’s design. This way, you can start building a brand online and you will launch a new sales channel quickly that will provide you with bigger profits.